시라쿠스, 이탈리아의 프리덤 | 호스텔월드에서 예약하세요. Freedom has been completely restored, furnished and equipped with all the comforts for our guests. Designed for a young and money-saving tourism. The Reception open at 7:30 a.m. and closed at 22:00 p.m.welcome to Freedom Bed&Breakfast we will provide you with any information you require. 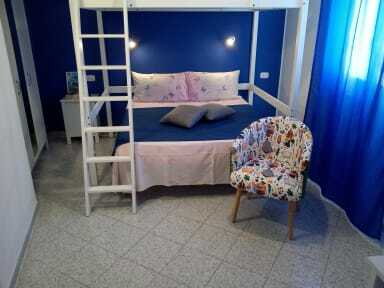 The property is located in a pretty Siracusa residence, just steps from the train and bus station. It consists of two bedrooms, a private triple room, complete with air conditioning and private bathroom but not in room, and a shared room consisting of six beds with chairs, lockers, writing desk, bedside tables and conditioned air. An air-conditioned day room with TV and sofa where you can relax, and a full kitchen with everything you need while outside a large terrace with sofas and chairs and tables.